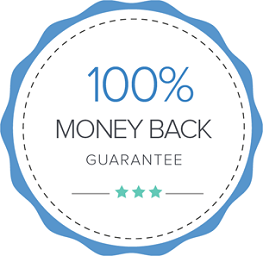 CPR Select offers a 100% Satisfaction Guarantee with the purchase of our courses. If you are unsatisfied with our courses, you may receive a full refund within 30 days of purchase as long as the certification exam has not been attempted. After the CPR exam has been attempted or after the certification card has been mailed, you will not be able to obtain a refund. We require personal information from you to complete the registration process including but not limited to name, address, date of birth, payment information and email address. This information is used to maintain customer records and process certification cards. It is not given to third parties except where explicitly stated or required by law. We may contact you in the future to share updates and promotions on our site as well as other offers that may interest you. You are required to maintain confidentiality of your username and password. CPR Select does not offer legal advice. Good Samaritan laws vary from state to state. State by state guidelines are not offered in our coursework. You will need to contact your state directly to learn about specific protection afforded to you when providing medical care. In addition, any other legal concerns should be brought to a lawyer. Information contained on our site is not an alternative to professional legal advice. CPR Select strives to provide you with CPR certification of the highest quality and the most professional online CPR course available. Our staff is available to work with you on any and all questions or concerns about our online CPR certification courses. We require that you attempt to resolve any questions or concerns that may arise in the present or future with our staff. Our course content is written with the latest guidelines in mind using materials available to medical personnel and the general public. Every effort is made, in good faith, to provide up-to-date, accurate, and complete information. We will not be held liable for any erroneous material on our site. Concurrently, our courses take a cognitive approach to CPR education. There is no guarantee that you will be able to successfully perform the procedures in our courses after taking the course. We suggest that applicants review the latest AHA guidelines and also consider AHA approved classroom programs that teach clinical skills along with the cognitive portion of CPR training. We recommend that you also review supplementary knowledge in CPR procedures, pre hospital training, hospital stabilization and other cognitive BLS skills. Our CPR course is not intended to be an all-inclusive education in Advanced Cardiac Life Support training and procedural instruction. By purchasing our certification or recertification course you agree that you take full responsibility for your actions and for how you implement any and all knowledge gained from our course. 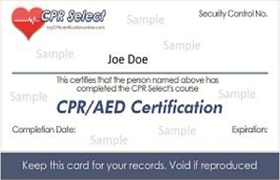 You also agree that you hold no liability to the CPR Select through MyCPRCertificationOnline.com whatsoever.